Accessed by a small alley off Jiřská, tiny Golden Lane contrasts starkly with the grandeur of much of the rest of the Castle complex. It comprises a row of tiny cottages built into the archways of the Castle fortifications after 1597 and was widened in later centuries. Legend has it that the name comes from Emperor Rudolf II’s alchemists, who tried to turn metals to gold there, but the lane was also home to gunners, as well as craftsmen and tailors. In the Middle Ages, Golden Lane was an overcrowded slum, a far cry for the picturesque tourist attraction it is today. Running above the cottages is a passage linking the White Tower with Daliborka. 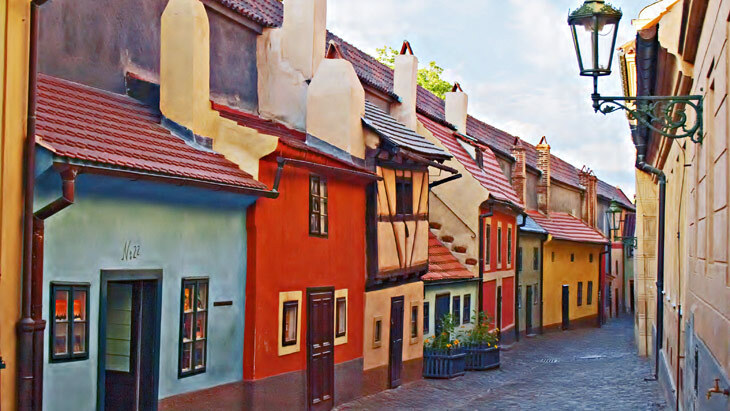 Golden Lane is also notable as the site of writer Franz Kafka lived at No. 17. Today, most of the cottages are souvenir shops. From the eastern end of the lane there is access to a viewing platform adjacent to the Daliborka Tower. © 2012 - 2019 welcometoprague.eu All rights reserved. Created and supported by Webdesign for You.